Labs 'n Life – Empowering our youth through positive engagement and interaction with Labradors. Targeted students from a school work with the same dog over a term, semester or year. Generally the selected students are experiencing significant barriers to a positive involvement at school. Work with the Labs ‘n Life “magicians” – the dogs – has consistently produced an increase in attendance and improved learning outcomes for the students. 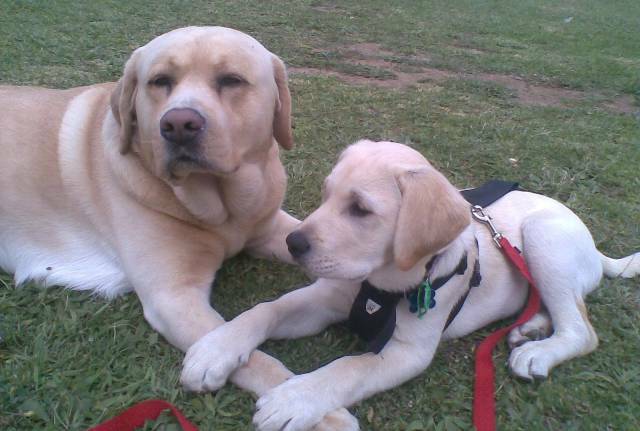 Labs ‘n Life use future assistance dogs in core programs and schools, to acquaint them with young people. The dogs become accustomed to spending quality time with young people, and working positively with them. Generic training includes basic obedience, food refusal, working in harness, and anchoring. Play activities such as finding treasure, catching food, bowing, etc are used by the child to give them the confidence associated with being listened to. Our Assistant dogs have been placed with families with children and young adults with autism, PTSD, diabetes and a wide range of special needs. This gives young people success because they are working with a dog already partially trained. Students have to discover effective communication. The dogs absolutely love going to “work”. They may be taken to conformation shows and exhibited by the young people. One year at the 2011 Adelaide Royal Show, 17 LnL young people exhibited their dogs, coming away with 13 places!